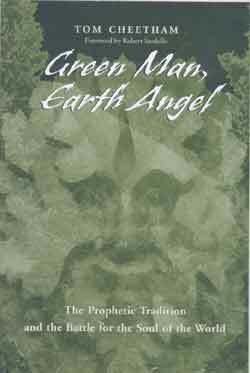 Green Man, Earth Angel is a passionate cry for the reclamation of the imaginal realm denied by the dualistic cosmologies of the Abrahamic religionsJudaism, Christianity, and Islam. We have lost a sense of participation in the world, or “gnosis,” direct connection with the transcendent world of symbols and symbolic knowledge” claims Cheetham (47). The myth of the Incarnation of Christ, especially, maintains a strict division between matter and spirit by figuring the incarnation of Christ as man as “kenosis,” or abasement (84). In Incarnationist theory, matter is corrupt, held in strict separation from spirit. These dualistic ideas provide the ground for Cartesian dualism, the prevailing episteme today, where Spirit becomes increasingly remote and abstract, associated with reason, while matter is viewed as demonic and subject to doubt. The result is the very “loss of the soul,” Cheetham writes. By denying the imaginal realm he argues, “we are left with a poisonous dualism of matter and spirit. ‘Stuff’ is severed from Intellect, and both are incomplete or disoriented because the ground of their contact is gone” (3). Cheetham finds an imaginal metaphysics, a way of restoring soul to body, in the cosmology of Ibn ’Arabi. Sufiism, an esoteric movement within Islam, maintains a vertical understanding of the relationship between spirit and matter, with matter as the extension of infinite subtle realms. In this tri-partite structure, the imaginal realm is a “form of intellection” that mediates between matter and more subtle perceptual realities. “The realm of being to which this intellection gives access is the place of vision and symbol, what depth psychology calls the world of the psyche and of the imagination” (3). Here, Cheetham presents highly rarified aspects of Sufi cosmology: the “luminous darkness of divine night,” that which underlies all things and from which emerges color and light, as well as the active principle that keeps things hidden, and Khidr, the Green man, imagined by the Sufis as the force mediating between the imaginal and the more embodied realms. Cheetham draws his analysis of the imaginal realm from Henri Corbin’s groundbreaking analyses of Ibn ’Arabi, and other Sufi authors: “He calls it the mundus imaginalis,” writes Cheetham, “the imaginal world, to underscore the fact that it is not imaginary or unreal. Through the agency of the active imagination we have access to an intermediate realm of subtle bodies, of real presences, situated between the sensible world and the intelligible. This is the realm of the anima mundi” (3). Green Man, Earth Angel calls us to grow the “resurrection body of the man of light that is hidden in the physical body,” and to perceive the “theophanic nature of all beings”: “that all beings are mirrors, places of theophany” (59). It urges us to recognize that instead of psyche existing in us, we exist in psyche, “the present moment is pregnant with creation (7). To recover the soul, he writes, is to recover the participative sense of things, the state of being one with the other. Cheetham in Green Man, Earth Angel presents an alternative mode of consciousness, an imaginal metaphysics where “The soul of this world we experience through a sense of interiority, as the availability of the world to the imagination, [is] a kind of reciprocal imaginative interaction, a sympathy between self and world” (7). When we establish a relationship with the symbolic, imaginal realm, when we learn to read nature as “Primordial Revelation,” (64) argues Cheetham, “We move…in a different space. This is not the universe of matter; it is more nearly a cosmos of qualities, presences and harmonies. The present is not transitory. It is not going anywhere. We are close to the origin here, close to the primordial distinctions. Space itself is substantial, qualitative, generative” (7). Cheetham finds also in Islamic thought a way of redeeming technology. In esoteric Islamic thought, all matter, including technology, is not fallen, but rather “a living part of the psyche of the world” (108). Green Man, Earth Angel is a very engaging read. Cheetham, however, presumes a royal we, and sometimes he is a bit bombastic and preachy. He makes claims regarding the presence of “presences” that might appear outrageous to an empirically-tempered scholarly audiencefor example, “We can only know who we are if we know who we are not, if we experience our boundaries by experiencing where they touch those of the Others” (29). He brings, nevertheless, much-needed attention to the ground-breaking work of Henri Corbin in the field of Sufism and provides throughout Green Man, Earth Angel a learned and cogent exposition of Islamic esoteric thought in the work of Ibn ’Arabi.